It’s been nearly a week since the darkest of nights gloomed even darker when the zombies of the Undead Army crawled through the streets and frightened strangers on All Hallows Eve. Purple Revolver came across some flesh eaters lurking in the darkest corners of Liverpool. 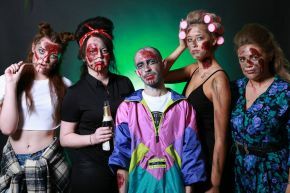 Instead of running away screaming like little girls, we decided to call in the help of our friends Voodou and Resurrection to give these zombies a Scouse makeover. With pink rollers in her hair and stilettos sharp enough to stab someone, the Walking Dead WAG is dressed to kill in a classic LBD, making sure she looked her bloody best for a classy night out at the Docks. Beware of the plaid and jean combo. Disguised undead students wander the streets every minute of the day in Liverpool. This particular Shuffler Student hides out in the darkest corners of Central Library. The Brain Eating Beauty from 1974 Liverpool does not do casual. Her hair is big and bold just how she likes her victims. She lounges around dressed in her fierce floral jumpsuit, gossiping on the phone whilst waiting for the next fleshy meal. Amy the Abomination is a savage when she sings into the microphone and is lethal when she’s had a few. Dressed in black she tries to blend in, but that big hair gives her away. Be cautious as you don’t know whose specks of brain she has in there. The virus must have found its way to Creamfields this year because this Roaming Raver is wandering the streets close to Club Peach and Nation. His multicoloured anorak should not be hard to miss unless it’s covered in a pool of gunged human blood. Voodou Liverpool created the horrifically fantastic hairstyles to which they were “super excited” to help out and “do something a little bit different” during their working hours. Leah Marggraf-Turley, Art Director at Purple Revolver and make-up artist for the shoot says of looks, “I had fun turning these lovely ladies into horrifying monstrosities." You don't have to wait much longer for more zombies. Issue 2 of Shoot Out will be gracing the indie shops and cafes of Liverpool next week with full pictorial of DeadFest 2014.